We are deeply committed to the wise use and management of our natural resources, and to the conservation of Africa’s exquisite natural heritage. 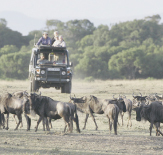 We employ basic sustainable tourism practices, and Howard is a founding member and Chairman of the Board of Trustees at the Kenya Wildlife Trust (KWT). Through this trust we and our guests support and facilitate conservation, research, and education projects in Kenya’s key wildlife areas. We have strong relationships with some of the most fascinating long-term scientific research projects on the planet, including the Mara Hyena Project, the Amboseli Trust for Elephants, and the Amboseli Baboon Research Project. We also support Living with Lions and Lion Guardians. Many of our guests have made significant donations to these research and conservation projects, and we often invite project staff into camp for short talks and lunch. In addition to these wildlife research and conservation projects, we are also involved with several education initiatives at KWT, including the Ngararambuni Nursery School near Solomon’s village near Amboseli and the scholarship program for higher education in conservation.